Spring 2009 will see Navy as the new black. I love the classic look of navy and the versatile nature of this often overlooked dark blue shade. 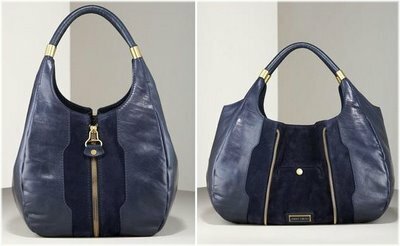 If pastels and bright colors are not your thing, then a navy handbag this spring is your best handbag investment. There are several options already up for pre-order on-line, but my No.1 choice is the Jimmy Choo Mandah Hobo. I wasn't thrilled with the "middle zipper"detailing on a few of the handbags launched by JC in 2008, but I think the Mandah shows how the kinks have finally been worked out of this design. Just look at how fabulous the bag is either zipped up or undone. The leather exterior features a suede inset that is visible on either version. The gold-tone hardware is minimal and looks very sophisticated next to the dark navy leather. A small snap pocket is accessible when the bag is converted to the un-zipped style. The Jimmy Choo Mandah Hobo tops my list of must-have bags for 2009. OK, so the year is only 7 days old. Sue me! I know what I like and that's final.